any of you have any cool scars? people tell me they like my scars but i don't think they are a big deal since i have had them for so long. i have a 7 inch long by maybe a thumb width long scar on my back and two half dollar size "holes" on my side from multiple lung surgeries. anyone have any big ones and what from? Re: let's compare our scars! When I was 8 years old I was attacked by a German Shepard, it bit my face. It healed pretty good but I have a big vein that pops out if I crunch up my face that travels across my nose in a diagonal direction. All I remember is vomiting blood and being in hospital loads. In case this made no sense, I basically swallowed so much blood that it came back up. Do emotional scars count? Haha. I'd say I got a little warped by college if that counts. What's his name? 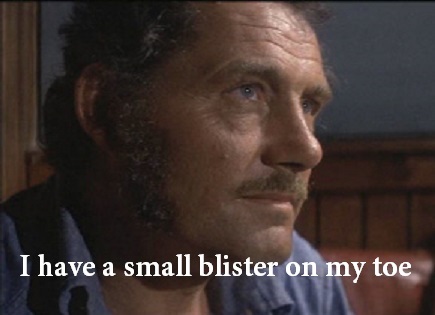 Jaws is the greatest movie ever made. just kidding. he's just an extra. 2:17 my dad is the guy in the red shorts and my uncle is in the blue shorts. he's in another scene too i just couldn't find it. sorry for the quality but i couldn't find a better one. i grew up in massachusetts and i guess my dad and uncle were around the set when they were filming it and they asked if anyone wanted to be in it for the beach scenes. martha's vineyard i think? he has one of the scenes that he's in framed loL. my aunt gave it to him as a joke gift. still kind of cool. i remember him telling me that in one scene he had to knock this old guy over and they had to keep shooting the scene over and over again and he felt bad. i guess he was told to hit the guy pretty hard to make it real. I've had 5 ear surgeries, 4 of them being tympanoplasty ones! tympanoplasty? is that when they use tampons to stop the bleeding? tympano plasty. Tympanic membrane=ear drum in the ear. Plasty surgery which involves molding or grafting. In this case, a graft is made from material such as ear cartilage. Then they cut behind your ear, around your skull, and fold the outer ear back, so that access to the ear drum is simple, avoiding the ear canal. It's quite painful. let's drink to our legs! I have an 8 inch scar on my right knee after an operation. My muscle decided it could not cope with a 300 kilo squat attempt. that was without wraps or with? holy cow. holy heavy cow! No wraps in my day old chap. Strangely i could deadlift 10 kilos more than i could squat. How it was and as it should be. I'm not a fan of the gear many elites use now. Re totals are impressive, but still . Glad they were able to put you back together! You should probably be advised that in the UK and Australian versions of English that has somewhat different meanings. In the UK it involves "birds", and in Australia it is generally the result of one's failure in the UK sense. Actually that could be misconstrued in a pretty awful way a well. Pulling =dead lift . Using deads for short from now on . I as for physical I have a lot on my elbow and from when I cut my leg open from skateboarding.